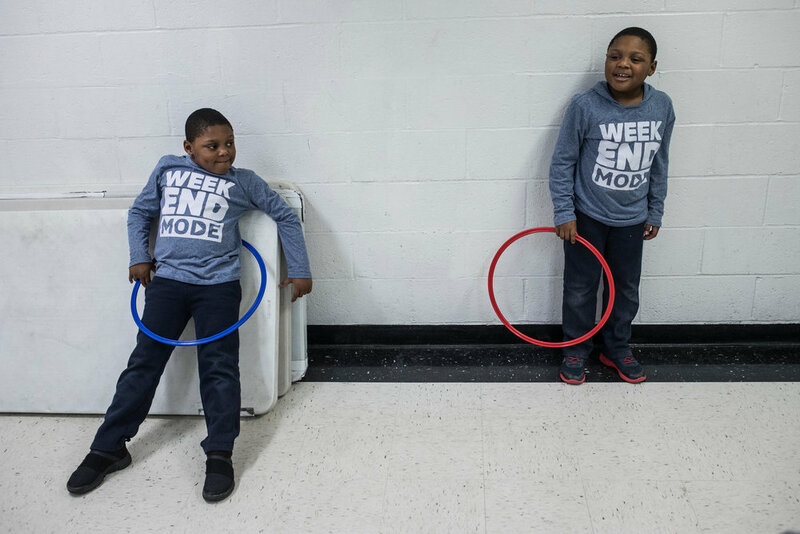 Hallway photos in Teisha Waterman’s Brooklyn apartment show her identical twin sons, Pharaoh and Phallon, dressed alike. They are both smiling, cute as two matching buttons. Around the corner, in the living room, the real boys are less sedate. The cracked television screen is a result of their raucous play sessions. Ms. Waterman keeps the other furnishings in her home spare and durable, to withstand moments of unrestrained behavior. “If it can be broken, it’s not going to last here,” Ms. Waterman, 41, said with a laugh. Her sons, age 6, are lovely, playful kids, but because of their severe autism, they also need special attention and parenting support to meet their social and behavioral needs. The boys were born 26 weeks into her pregnancy, and each weighed less than 2 pounds. Doctors said early on that they had autism, and Ms. Waterman has struggled to get them the services they need, including occupational therapy and specialists to help them eat with utensils and communicate by using gestures. Even by age 3, the boys did not respond to their names or other verbal communication, from their mother or between themselves. Only recently have they begun to acknowledge each other and play together. Interacting with other children remains problematic. At the playground, Ms. Waterman must often intervene, and offer apologies or explanations for awkward behavior from the boys. Pharaoh is prone to tantrums that can include hitting himself, screaming and ramming into his mother. The boys also are liable to bolt into the street and simply keep running, she said, so she must hold them tightly. She avoids playgrounds with more than one entrance and must tends the exit closely. “They have no sense of fear,” said Ms. Waterman, who raises the boys along with their father, her longtime companion. Even with both parents’ salaries, after covering the monthly rent of $1,100, plus utilities and other expenses, the parents are barely able to cover the many out-of-pocket expenses related to the boys’ care, including behavior analyses and therapy critical for children with autism spectrum disorder. The summer camp at the Shorefront YM-YWHA of Brighton-Manhattan Beach in Brooklyn has become vital to them. Its services include special programs and services for children with autism and developmental disabilities, including swimming, trampolines and sensory integration. The Shorefront Y is a beneficiary agency of UJA Federation of New York, one of the eight organizations supported by The New York Times Neediest Cases Fund. When Ms. Waterman was unable to afford camp fees last summer, $1,260 from The Neediest Cases Fund covered part of the cost. “They can’t go to a mainstream summer camp — it’s too dangerous for them to be in groups with 12 kids to one counselor,” said Ms. Waterman, who has been frustrated by delays in New York State’s developmental disabilities services. After more than a year of delays in processing her sons’ applications, she said, she finally sought help from the Legal Aid Society’s health law unit, which has helped her make progress. Ms. Waterman grew up in Brooklyn and earned a bachelor’s degree in criminal justice. She worked in the Bronx district attorney’s office as a community associate, largely documenting police officers’ testimony. She found the job so upsetting that she eventually quit. She has worked at several Manhattan law firms and now works as a legal coordinator for Beam Living, a management company for the Stuyvesant Town residential complex in Manhattan. To keep the job, she must pay for after-school programs for her sons, she said. As strenuous as it can be, she said she is buoyed by the boys’ compassion and affection. Older PostThe New York Times: How Does Bail Work, and Why Do People Want to Get Rid of It?